The Secure Document Shredding Choice For You! 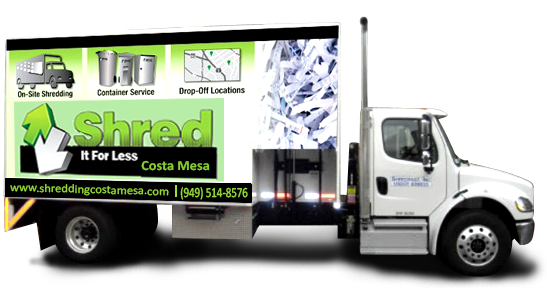 Costa Mesa residents and businesses have a great option available to meet all of their secure document shredding needs. No longer does paper shredding have to be a dreaded chore of mindlessly feeding paper into a machine for long periods of time that would best be spent on other activities. Thanks to Shred Connect’s secure document shredding services, disposing of sensitive and private information securely has never been easier. Whether you just want to get rid of monthly bills and offers or are a business owner or manager taking care large scale document destruction costa mesa that has accumulated over several years, our company offers secure document shredding services that will meet your needs. Secure Document Shredding Comes to YouShred Connect provides two options for customers looking to employ our shredding company. The first is our brick and mortar shredding center, which is typically used by people who have just a few items to just a few boxes. Conveniently located, the center offers customers the opportunity to bring in their documents on their own schedules. It takes just moments to bring in documents to our drop off location. Drop and Shred services are for those who don’t feel the need for the added security of having their documents shredded in front of them. However, we offer the opportunity for customers to leave their names and addresses so that we can provide them with a Certificate of Destruction, proof that the costa mesa shredding services have been completed and the documents will never fall into the hands of those with poor intentions. For those with larger jobs, especially businesses that don’t want to take employees away from their jobs to spend countless hours shoving paper into machines, we also offer mobile shredding services. Simply call us to schedule an appointment and we’ll send one of our mobile document shredding units to your home or place of business to destroy the documents right in front of you. Documents that would otherwise take hours to destroy will be gone in just minutes. Included with this service comes a Certificate of Destruction, which could prove extremely important for record keeping should questions arise later. The added benefit of this secure document shredding service is that sensitive information never has to leave your facility, limiting the risk of having a disgruntled employee steal proprietary information or having a simple mistake, such as misplacing a box in a public area, turn into a major problem for the business. Why Worry About Secure Document Shredding? Why, though, is document destruction costa mesa so important? After all, it doesn’t earn money for businesses. It’s not fun. It doesn’t educate children or put food on the table, so why should anybody care? Even for those who want to get rid of documents, it’s not urgent, is it? Well, much of the same could be said of buying insurance policies. If you wait to get one until you need it, it’s too late. Think of our paper shredding services as an insurance policy. For individuals, the most pressing reason to make use of our secure document shredding services is the potential for identity theft. A Social Security number, a birth date, an identification number, or, in the worst case scenario, a credit card offer, all give thieves the information they need either to empty out your existing accounts or to open new accounts in your name. People have seen their credit destroyed because people opened up credit accounts in their names without their knowledge. They didn’t even find out about it until they applied for mortgages, tried to buy cars, or attempted to get credit cards. While it’s certainly true that many of these cases have been the result of the electronic theft of information, old fashioned paper in the form of bills, receipts, bank statements, and other records have also been the sources of information for countless such cases. Another reason individuals would want to have their documents destroyed is to protect their privacy. Divorce records, medical records, contracts and other personal information are often kept confidential for any number of reasons. Leaving these things around the house for your children, spouse, other family members or friends to find can mean that those closest to you find out things that you never wanted them to know. Why take the risk of letting them find this information when you can destroy it instead? 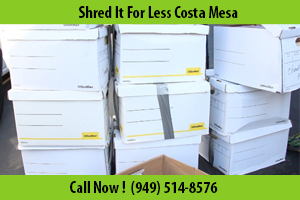 Businesses in Costa Mesa have other motivation to use our secure document shredding services. For starters, keeping confidential information of clients, partners, and venders can result in such information being stolen. Should that happen, business owners and managers could be held legally responsible, leading to lawsuits and even jail time. Beyond that, though, proprietary information about a business could be accessed by or shared with competitors or reporters by people within the company or when such information is thrown away intact. With so many reasons to destroy documents, there’s no reason not to make use of Shred Connect’s convenient paper shredding services. Call Shred Connect today, one of the best shredding companies in Orange County, to take care of all of your secure document shredding needs.